The standard cast off is where most knitters start. It creates a chain edge which looks very similar to a crochet cast on but different to most commonly used cast on techniques . I won't cover the basics here since you can find those instructions in any knitting how to guide. Some knitters like to leave a long tail when they cut the yarn to secure through the last stitch to use for seaming. It does save on ends to weave in during finishing. I don't like to do that. I prefer to seam with a separate length of yarn. I like to be able to pull the seaming yarn out of my work if the seams don't line up exactly the way I want them to. A separate piece can be tugged out but an attached one takes more work to remove. I'd rather weave in more ends and be able to correct my seam if necessary. Remember there are no knitting police, choose your method accordingly. Step 1 K2tog through the back loops. Step 2 Pass the stitch just made from the right hand needle back to the left, maintaining stitch orientation, repeat Step 1. Step 3 Cut the yarn and pull it through the last stitch. There are variations on this using SSK or purl 2 together (for the purl side of the work) instead of K2tog through the back loops. Some knitters find these methods to be a little looser than the standard cast off. 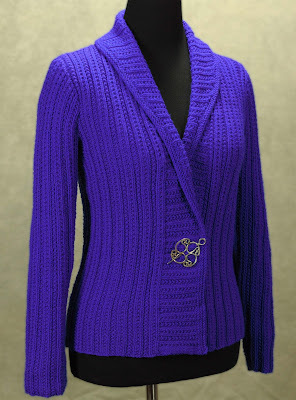 The edge of the cardigan pictured above is finished with two rows of knit and then the standard cast off done evenly on the straight sections and loosely on the curved part of the collar. My next post on cast offs will be about what to do when your edge is too tight. Part 1 is here. A blog reader and happy knitter of my patterns recently asked if there was anything she could do to help me. (As usual I'm astounded by the kindness of the knitting community.) The answer is yes! In our online world favoriting and queuing my patterns in Ravelry means more knitters see them and hopefully buy them. How does faving and queueing cause more knitters to see a pattern? Good Question Sigrun. When knitters go to Ravelry and do a search, for example if they search knitted pullovers patterns for adult women. Patterns with more activity turn up earlier on the pages so it means the difference between being on page 6 vs. page 209 of 16,000 possibilities. They can also search by most projects, most popular, most favourites and most queued.